Looking for a place to mix and mingle with high tech companies in Las Vegas? HiTech Vegas might be the perfect place for you! She believes startups need to network with established technology companies, so they can partner or conduct commerce with established brands. From getting new customers, partners, affiliates, or other relationships, Lori Nguyen believes Vegas Tech startups can benefit from meeting high tech companies at HiTech Vegas events. In her eyes, entrepreneurs face 3 main challenges — funding, R&D expense, and a well-executed business/operations plan. The future is bright for HiTech Vegas! 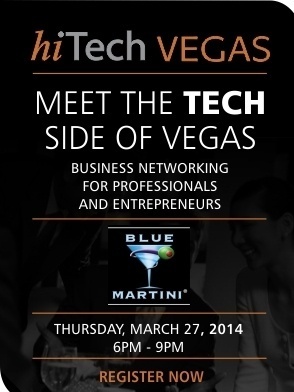 The next HiTech Vegas mixer is Thursday March 27, 2014 from 6:00 pm – 9:00 pm at Blue Martini at Towne Square. Register to attend here!